Attica, OH — (March 26, 2016) — For Caleb Griffith (410 sprints), Mike Bores (late models) and Jason Keckler (305 sprints) opening night at Attica Raceway Park was a big success. All three earned their second career feature wins in front of a huge crowd on Construction Equipment and Supply Night. Sandusky, Ohio’s Griffith survived a restart with six laps to go – the only caution in the 30-lap O’Reilly Auto Parts 410 Sprint feature – to take the win over six-time Arctic Cat All Star Circuit of Champions titlest Dale Blaney and Brian Lay. Griffith, Attica’s 2014 track champion, led every lap of the feature. “There were a couple of laps where I missed and got sloppy in traffic and I’m thinking ‘Dale’s (Blaney) going to make you pay so you had better get up on the wheel.’ Then the yellow comes out and I see Red 45 (Lay) is running second and Stewie (Brubaker) is running third and I’m thinking ‘yeah we got local fellows up on the podium tonight.’ I don’t know how it ended up but Red (Lay) rolled under me a lap or two on the restart but once we got rolling I figured we had enough to go the distance,” said Griffith beside his Ray Marshall Motorsports, Buckeye Machine Fabricators, J&J Auto Racing, K&N Filters, Fastenal of Kenton, John and Tammy Updegraff’s Blue Room, DPI Ink, Hempy Water of Forest, Lima Powdercoating backed #33m. “This is huge. I’ve wanted to win an opener for as long as I’ve been doing this. This is huge for this race team, Ray Marshall, Jamie Adams, Craig Brickner, Vic Eilrich my old crew chief came on to help for a couple of nights to help get us off on the right foot,” added Griffith. It took a few tries to get the Summit Racing Equipment UMP Late Model feature rolling but when it did, so did Bellevue, Ohio’s Mike Bores as he led all 25 laps. He had a couple of tense moments though. While trying to lap his father, John, the pair made contact and then there was a restart with only one lap to go. “My helmet was fogging up and I was like ‘come on let’s get this thing going.’ He (John Bores) would go to the high side and I’d go to the bottom and he would pinch me off and I was like what’s going on and I don’t know where the 27 (Eric Spangler) is…I gotta go. This is pretty cool to come out with a new car and get the opening night win. I would like to thank Roeder Racing, Underground Utilities, Fultz Fabrication, York Fabrications, Cam Tech, Accu Force, Burns Electric, Brent and Eddie and all my guys,” said Bores. In the Fremont Fence 305 sprint feature it looked like Bobby Clark was on his way to another feature win. But, Fremont, Ohio’s Jason Keckler would find the high line to his liking and took the lead with five laps to go to score the victory. For Keckler the win was even more special as he had contemplated quitting racing over the winter. “We were 90 percent done and in late January we decided to get a new car and try it. I’m trying to get over the fact that I passed Bobby Clark to win a race. The car was pretty good all night long. Driver error was the biggest thing. After that last caution (with 10 laps to go) I just moved up a foot and it just took off and I started catching Bobby. Once I got to him it was like ‘don’t mess up, don’t mess up.’ Then when I got ahead of him I messed up almost ever lap after. I have to thank my mom and dad…he puts a ton of work into this…Rick, my sister, my grandparents, Meggit Farms, Level Performance, Bob Foos,” said Keckler. “What probably got us racing again was at the end of January my grandfather passed away so to be able to win the first race after his passing means a whole lot to me,” added Jason Keckler. Griffith and Jody Keegan led the field to green for the 30-lap 410 sprint feature with Griffith rim-ridding into the lead. Lay would drive into second on lap two with Keegan, Chris Andrews, Stuart Brubaker, Blaney, Brandon Matus and Max Stambaugh in tow. Griffith would catch the back of the pack by lap five and had a comfortable lead over Lay, Keegan, Brubaker and Andrews. Brubaker would drive into third on lap six with Blaney moving into fifth by lap seven. With just 10 laps scored, Griffith encountered heavy lapped traffic as he continued to lead Lay, Brubaker, Blaney, Keegan, Byron Reed (up from his 15th starting position) and Andrews. Griffith patiently picked his way through the traffic as Lay, Brubaker and Blaney gave chase. Reed would crack the top five by lap 13 and was closing on Blaney until he spun on lap 24 for the feature’s only caution. Griffith now had a clear track but had Lay and Brubaker on his rear bumper. The car on the move now was Travis Philo who had worked his way to six from his 12th starting spot. When the green flew Lay tried to drive under Griffith several times but his front wing collapsed and Griffith was able to pull away the remaining three laps. Blaney would nip Lay at the checkers for second with Brubaker and Philo rounding out the top five. In the late model feature, Mike Bores and Eric Spangler would bring the field to green. After a lap was completed Bobby Michaels would spin. On the restart Scott Phillips and Kent Brewer would tangle. On the ensuing restart Phillips and Dave Hornikel would spin. When lap two was finally scored Bores led Spangler, Matt Irey, Cody Scott and Jon Henry. With four laps scored Nate Potts, Hornikel and Doug Baird would tangle for another caution with the running order Bores, Spangler, Irey, Henry and Ryan Markham. When the green reappeared Bores would pull away slightly from Spangler with Irey comfortably in third while Markham and Henry waged a great battle for fourth. Bores would catch the rear of the field by lap 11 but Spangler could not close with Irey, Markham, Henry and Devin Shiels in tow. Bores would catch up to his father with five laps to go and made contact as he tried to lap him. Spangler closed to within a couple of car lengths with Irey and Markham also closing. Once he got by, Mike Bores pulled away once again. It was, however, short lived as Michaels would spin on the white flag lap. Bores would hold off Spangler, Markham, Irey and Shiels the final lap for the win. Tyler Street and Seth Schneider would bring the field to green for the 25 lap 305 sprint feature but before a lap could be completed Dan McCarron made contact with the front stretch wall and flipped. He was not injured. On the ensuing restart Dustin Dinan would slide off turn one, necessitating a third start. This time fourth starting Clark would vault into the lead over Street, Keckler, Luke Griffith, George Englert and Ricky Peterson. The caution would fly on lap four for Thomas Schinderle who would bring out another caution a lap later. Matt Foos would spin on lap seven to slow the pace of the race. Clark would continue to lead on the ensuing restart over Street, Keckler, Griffith, Kyle Capodice, Englert, John Ivy and Paul Weaver. Dinan would bring out the final caution on lap 14. On the restart Keckler would drive around Street for second and started to close quickly on Clark. With five laps to go Keckler was racing to Clark’s outside as they entered heavy lapped traffic. Keckler would drive into the lead on lap 21 with Clark, Street, Ivy and Griffith giving chase. Once in the lead, Keckler would continue to rim-ride to the checkers with Clark, Street, Ivy and Steve Rando rounding out the top five. 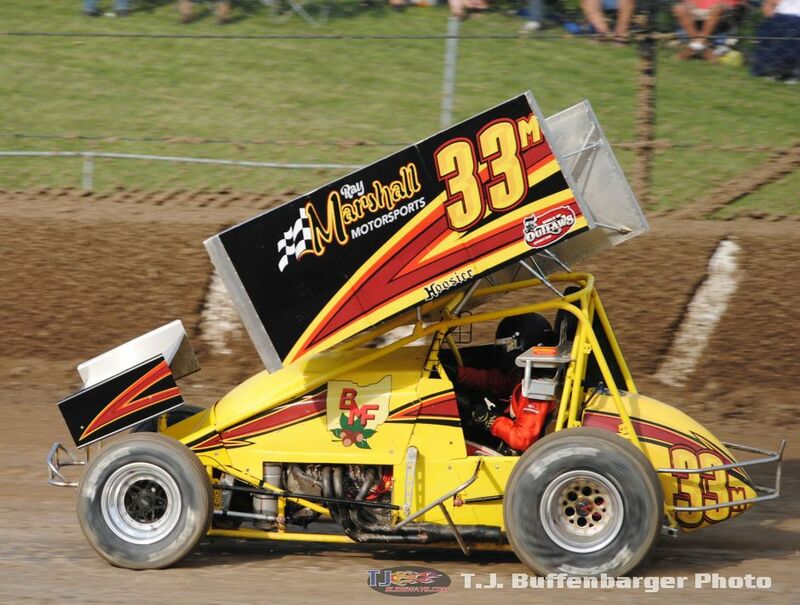 Attica Raceway Park will be back in action Friday, April 1. Racing on Fisher Performance Night will be the 410 and 305 sprints and late models. For more information go to www.atticaracewaypark.com, follow the track on Twitter at twitter.com/atticaracewyprk and Facebook at www.facebook.com/atticaracewaypark.